I took off all the lids and scuffed them up a bit with the sand paper so the spray paint would adhere better. After laying out some newspapers in the back yard, I sprayed a couple coats waiting about 20 minutes between each. Make sure to get the sides coated as well. You do want to make sure to do this in a well ventilated area or I can’t guarantee that you’ll be writing legibly or coherently by the end of the spraying process. While the lids dried, I washed out the jars with hot soapy water with a tiny bit of bleach to get rid of any traces of what was previously in the jars. After about a day to let the lids and jars dry thoroughly, I filled and labelled. Best part is nobody knows about my atrocious spelling because everything is easily erased ;) I actually made these jar lids last summer, but with all the moving I haven't had time to get them out of the box…until now. We buy a lot of dry goods in bulk, and instead of hoarding a bunch of half used bags of rice and nuts clipped closed in an unorganized pile at the back of the pantry shelf, I’ve poured the contents into my jars which can now be labelled and dated if necessary. It’s also handy that the jars can be organized a few deep on the shelves, but the labels are still easy to read. No space is wasted on our already crowded pantry shelf. A little something I learned after carrying this out, MAKE MORE THAN YOU’LL THINK YOU NEED! I’m finding uses for them all over the house: the bathroom for baking soda and Epsom salts, the office for paperclips, my studio for buttons, and odds and ends, and of course the kitchen for baking supplies, nuts, dried beans and lentils, rice, and popping corn. Are you a jar saver like me? What do you use your jars for? What other clever items do you save for cheap storage? Love the idea. I have been looking for a new "recycle" alternative to meet our pantry needs!! Thanks :) It has been really handy so far! Now I can't seem to find enough jars to hold all my dried goods...I'm a little addicted to this project! Brittany, I love this idea! What is it about jars that makes them so hard for me to throw away? I have oodles in the attic. I might just have to haul them out and use your idea for better pantry storage. 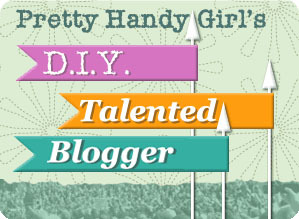 Thanks for linking them to the DIY Talent Parade! I hope you had fun.